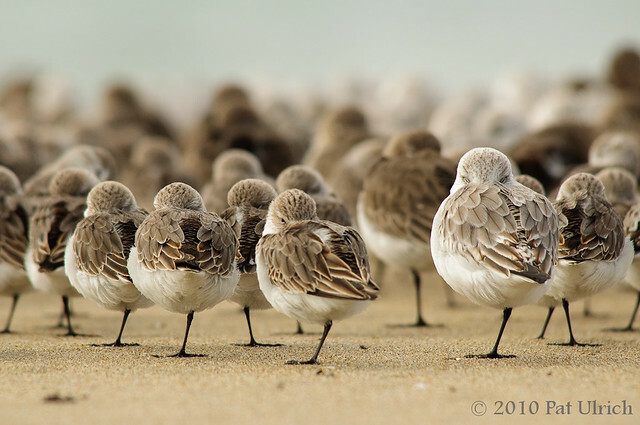 Group shots of shorebirds can be challenging, as you need to find an interesting subject to frame, and also a pleasing formation of birds to make up the rest of the image. Here are two shots that I haven't decided yet where I stand with them -- they both had potential, but also have some flaws. In the first shot, I like how the birds are arranged and overall I like the composition. However, the front-most western sandpiper is just outside of the focus, which can be a bit distracting compared to the sharp sanderling that is the focal point for my eyes. For the second shot I changed the apeture to increase the depth of field (f/8 to f/11) so that the front western sandpiper is now in focus enough to be less of a distraction. However, I don't quite like the arrangement of the birds as much from this vantage point. I do like the depth provided by the crowd in the background of this shot, though. Submitted as part of the World Bird Wednesday blog meme -- Follow the link to check out the entries for this week! Amazing shot! We invite you to add it to our Wildlife Map @ http://yourwildlifestories.com Thanks! 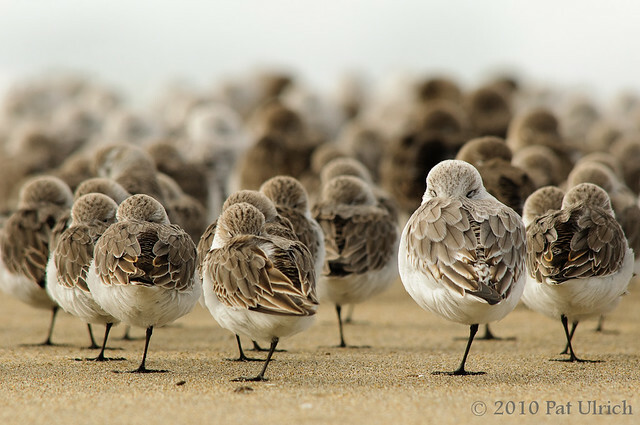 I photograph lots of shorebirds so it was really great to read your expert comments on photographing them. Thanks! The perspective and DOF on my turkey shot on WBW is a tribute to my fascination and infatuation with your art. Both are lovely images.You have inspired me to lie down to take photographs. Both great!! But I think I like the second best. Boom & Gary of The Vermilon River, Canada. Both excellent shots Pat. I like the second one best because my eye is drawn to the Sanderling and I find the darker bird in front of it distracting in the first image. Thanks everyone for your kind words! @Springman: I really like your turkey shot, the low angle and setting were great! As for NG, if you're referring to the contest, they did announce the winning photo, and you can see it here -- the Viewer's Choice is the last one listed. I still think its pretty cool to have an image on their site, though! Thanks again to everyone that voted! @theconstantwalker: Glad to hear you're inspired to go prone -- that's really the only way to photograph birds on the ground. The images are much more intimate when you are at eye level. There are technical reasons to do it too. Since you're shooting straight at the bird, as opposed to an angle from standing height, the film plane/digital sensor is more parallel to the subject, meaning that you can get more of the bird in focus (ie, sharp). I felt funny laying down on the ground in public at first, but its totally worth it! Both are excellent shots Pat. Thanks for your suggestions, holdingmoments! I vote the shallower depth of field. I think it adds more pop to the larger peep. Sharpness I couldn't tell at this size. I'll trust your judgment there.